If you had to pick one airline in the world that you’d hate to be running right now, Turkish would be at the top of the list. (Congratulations to Malaysia Airlines for being knocked off the top spot.) With increasingly high profile bombings and now a failed coup attempt plaguing Turkey, people are scared. That’s going to be a tough situation for any airline, but for one that’s growing as rapidly as Turkish, this could be dire. Just look at Turkey’s location on a map, and you’ll quickly see why things aren’t stable here. Turkey may be on Europe’s doorstep, but it also shares a long border with Syria, Iraq, and Iran. There is, of course, ISIS in these areas and Turkey is not only fighting them but helping the West bring the fight as well. (The US has been launching attacks from Turkey.) But there is also the fight between Turkey and Kurdish separatist groups not only in Iraq and Syria but also within Turkey’s borders itself. Much of the instability isn’t just due to geography, of course. Turkey’s President Recep Tayyip Erdogan has been increasingly trying to consolidate power under his rule. Over the last couple of years, a fragile peace with one of the Kurdish rebel groups has fallen apart. He has focused his efforts on fighting them, and some suggest that he hasn’t done what he needs to be doing to fight ISIS. All of this instability and anger means there have been bombings, and a lot of them. Here’s just a handful from this year. You get the point. This isn’t even all of them. But while in same cases tourists were targeted, this didn’t get the kind of attention that would sink Turkish Airlines’ fortunes. Though people knew vaguely about potential risks in Turkey, it didn’t seem to be a huge issue for tourism. In fact, when I went Across the Aisle from Turkish Airlines CEO Temel Kotil earlier this year about whether he had any concerns about issues within Turkey, he said this. If you know the numbers with tourism, it’s still solid. Last year Istanbul increased 7 percent, worldwide average is about 4.7 percent. And Istanbul hosted about a million tourists. It’s damaged the numbers of course, but our transit ratio is already 55 percent internationally, almost half the income. We’ve surpassed Frankfurt and we’re supposed to pass Charles de Gaulle, Paris. I believe maybe tourism is not as perfect as it used to be. In the Russian case it’s because of some restrictions between Russia and Turkey. But we have Saudis that come in big numbers on the Black Sea as a tourist. Still, the Turkish economy I think is still functioning good. We grew 21 percent. That’s a big number. My how things have changed in the last couple of months. First we had the bombing that killed more than 40 at Istanbul’s main airport on June 28. Even though that happened in the baggage claim area, far from where transit passengers would go, it still spooked people who were connecting. From an airline perspective, there is an immediate impact. Though the airport was only closed for a brief period following the attempted coup, the US became so concerned about potential security breaches that it shut down all flights between the US and Turkey. Further, US airlines can’t fly through Turkish airspace. This restriction remains in place, and may stay that way for some time. This isn’t a huge issue for US airlines. None of them fly to Istanbul anymore (Delta’s planned summer service was canceled before it began). Sure this could impact a couple of flights that might prefer to fly through Turkish airspace today, but that’s relatively minor. For Turkish Airlines, however, this is devastating to have to suspend all US service. But it is going to be a temporary measure, and eventually Turkish can resume US flights. The question is… what will the aftermath be? I’m really curious to see passenger numbers, but I imagine that we’ll see some serious drops in demand for Turkish flights beginning this month. Turkish already often wins travelers over by offering cheap fares. But if even price advantages fail to sway customers in the aftermath of this month, then Turkish is in trouble. This is similar to what Malaysia Airlines faced after its two high profile crashes, but Malaysia wasn’t an airline sinking a ton of capital into expanding its reach quickly. There is once saving grace for Turkish. About half the airline is owned by the government. So, as long as Erdogan sees fit to continue to push Turkish as a fast-growing airline, he can do it. And he can fund it. If Turkish needs to be a profitable business, however, that’s going to be a real challenge. The bigger threat is if either a change in strategy or change in leadership in Turkey leads to a different strategy for Turkish Airlines. In a volatile situation like this, you just don’t know what could happen. This isn’t an issue for other fast growing airlines (Emirates, Etihad, Qatar) in the region today. Here in the US, we take it for granted that we have a stable government. That’s not the case everywhere, and things look more precarious in Turkey than they have for some time. You can only feel sorry for those at Turkish Airlines who can do nothing but watch this unfold. My Godson is scheduled to fly KUL/IST/ATL on July 30th.So far, I’m not changing his ticket. I’m booked to fly ATL/IST/DBV in September. Originally had an overnight in IST (love that city!) but I’m going to now just transit. I wish the airline and the wonderful people of Turkey good luck. I feel sorry for the Turkish crews that are caught here in the US. In Miami, we actually had a flight depart while the coup attempt was in progress. However, since then, the crews and passengers have been staying in the hotels booked by Turkish Airlines with no idea if and when they will be able to fly. I imagine some of the crew are loving the expense paid stay in Miami or other US cities! You would think, but I am sure they are worried about the safety of their families. Also, I wonder (doubt) if the Turkish crews are getting paid while being stuck in the US. That depends if they have a daily minimum amounts of hours per day per trip!!! I just read the travel ban has been lifted, so things should start moving now. Shame to see what is happening in Turkey. It is (was?) just about the only secular (non-theocracy), US-friendly countries in the region, aside from Israel, and it has so much history and culture going for it. I spent a day in Turkey as part of of a cruise in the Med, and it is on my shortlist of places to go, but may have to wait until things settle down a bit. The flip side of all this is that it will be interesting to see how low fares go once flights to Turkey start operating again. With any luck perhaps the government will push Turkish to run flights at money-losing fares to help jumpstart the airline’s business and the country’s tourism again. We once flew on Turkish LHR to IST and were quite happy with it. They advertise flying to the most countries of any airline in the world. I think Erdogan must be senile. He wants USA to fight Syria. Will Syria attack USA? Will Syria invade Turkey? Ridiculous! I hadn’t realized no US airlines serve Turkey anymore. That makes it very easy for the US to (temporarily) ban flights between Turkey and the US since it only impacts Turkish Air. The airline will survive as it’s a big country and it’s people will still need to travel. Flights to North America may have to be cut back for awhile with only one or two cities served, but things will pick up again one day. Yes I know. Everyone was commenting before the ban was lifted and what would happen if Turkish lost a lot of business. I said their flights may have to be cut back to North American with maybe one or two cities served until business picked up. But with the ban lifted, that changes everything now. Just wondering about travel US to/from Europe for the rest of July, into August and September. Brussels, Paris, Nice, asylum seekers from the Middle East, the Brits/EU situation over there. Almost daily flashes of gun violence, election season yelling/screaming over here. Any evidence that these matters are materially affecting the amount of transatlantic travel by Americans and Europeans this year? –where they are visiting on vacation/holiday (cities or countries they may be avoiding overseas/sections of the US they may have decided not to visit)? –how long they are staying? A few weeks back UA lowered the to Europe ecomomy saver-award mile requirements. Only open a few days, and travel couldn’t begin until Aug. 23. (Aug. 23 seems to be the magic date for fares to go down anywhere–domestic and international). Maybe UA might decide to open up things again? Anyone now wonder if naming an airline Brussels Airlines was a good idea, but like anyone really liked the name Sabena? I still like the name Swissair. To me, it sounded like an airline, not some type of cheese or brown cow. Jaybru – I don’t have any data that would substantiate this one way or the other. You might get some color on airline earnings call that are happening around now, but data probably won’t come out until later on. As you know, carriers can manipulate earnings to show or hide whatever they want. I’m just wondering about numbers of people, types of people, and any changes in their behaviors. Perhaps what I’m trying to get is the stuff travel agents get to see and discuss with their association members. But, the Swiss, they were really, really wonderful, thank you! jaybru – No, I’m not talking about the earnings numbers. On the call they will discuss these trends in detail. Analysts will ask about it. The strong US dollar will always impact inbound tourism to the US. Travel between the US and Europe is always strongly originating from the US in the summer and the strong dollar has only strengthened demand from the US. Travel to the US originating in Europe is strongest in the winter and that travel has been depressed because of the strong dollar. The Euro/Dollar relationship has been relatively stable for over a year but the Pound is much weaker. Delta specifically stated that they expect travel from the UK to be reduced in the winter and it is expecting to pull capacity in conjunction with Virgin Atlantic. It is certain that the other US carriers will say the same thing or else experience unit revenue declines from the UK if they do not reduce capacity simply because a weaker Pound will reduce demand for outbound UK vacations. Until the UK proves that it can stand alone without the EU, the Pound will likely remain depressed. As for Turkey, increased terrorist attacks are likely because Turkey supports the US in allowing the use of Turkish air bases for operations in the Middle East. IN addition, as noted above, their President is becoming increasingly authoritarian. Plenty of ways to get killed in the US, by terrorism or otherwise. No need to fear travel to Europe, IMO. Poor Turkish airlines?!?!?! NO poor people stuck with flights that aren’t valid, flights they are scared to take, etc. I was to fly out on Aug 1 from the US. Got word of the FAA lockdown (and the gov leaked doc that states the closure was to remain in effect until Aug 30). I proceeded to cancel my flight via Priceline and then my cc company. Both companies and myself tried to contact TA. All phone lines were down and full message inbox. You couldn’t communicate with the company for over 30 hours. Now, the ban gets lifted today. All of my reservations have been cancelled (hotels, cars, connections, etc). All others were cancelled without incident or fees but Turkish air refuses to refund. Horrible that I have to eat $1000 USD. I will never fly that airline nor recommend it to anyone else. You can’t put a price on people’s safety. Aug 30, eh? Quite the leak, given that the flight ban has already been lifted. Do any other airline offer refunds on Turkey travel? I checked UA and they wave change fees for postponed travel, but no refunds. Oliver – Usually refunds aren’t allowed unless the flight is canceled. Turkish was actually pretty generous in this part of the rule. Give TK a break. They just had a multi day disruption of their business… There is NO WAY a call center can be staffed to handle the number of calls I’m sure they were receiving. Let the dust settle. I’m sure if you call back in a week, they will re-instate your ticket. Going forward, always but trip insurance. It would have covered this event. But other airlines are much better at handling irregular operations, think Lufthansa during strikes. There are many things to like about Turkish airlines, their on board product, their Istanbul lounge and their impressive list of destinations. But their crisis management is very poor. You could argue that a terrorist attack and a coup are very unusual things to cope with, but their poor crisis management also shows when snow or poor weather closes IST. They could do much better. I see your point and have heard the same about TK during IROPS. That being said, if not traveling in the immediate future my vote is chill, wait a few days for the dust to settle and understand that the airlines infrastructure is taxed to the max during a crisis. Trying to solve a problem with a flight a month away is only going to cause frustration to you, and keep someone scheduled to travel tomorrow from getting through. I agree with most of this however IST is one of the busiest airports in the world. It’s a major hub for Europe and even the Middle East. If Turkish can’t make it then another airline will fill the gap there. IST is one of the busiests airports in the world BECAUSE of Turkish airline. Was at the Atlanta airport around 11:30 pm on the day of the coup in Turkey to pick up a friend and noticed a Turkish 777 taking off (was 6:30am in Turkey which by then the government over there had taken control again) so was kinda surprised to see that after hearing all flights between US and Turkey had been cancelled. It’s not like we haven’t seen this before. When I traveled for business in the 1990s there were lots of terrorism attacks and threats. Same old. 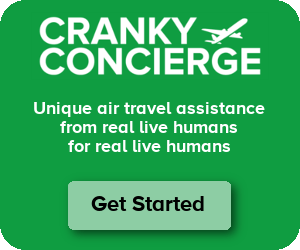 Cranky on the Web: Bereavement Fares Gone, Schedule Charters on the Rise, US Airlines Aren’t the Best?